The Polisario leader Mohamed Abdelaziz and his close aides have had a bad weekend. 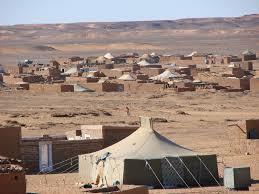 The Rabouni camp which hosts the Polisario headquarters has actually been since Saturday the scene of an uprising geared by members of the Rguibat Al Bihat tribe, the largest in number in the Tindouf camps, and of the Swaed tribe. Most of the Polisario leaders, including their chief Mohamed Abdelaziz, sneaked out of the premises out of fear to see the uprising spread out and get out of control. Abdelaziz, who fled his home in Rabouni Saturday aboard his vehicle, spent the night going back and forth between the Aaousserd and the Laayun camps, the same source said adding that he was accompanied by his wife Khadija Bent Hamdi. The two traders were driving their truck loaded with goods destined to the Tindouf camps when they were arrested by Algerian mounted police at a checkpoint. The loaded vehicle was seized and the two traders were humiliated and violently beaten by Algerian soldiers before they were handed over to the Polisario security services. As soon as the news reached the camps, the two tribes organized a protest movement and marched onto the Polisario headquarters in Rabouni. The marchers strongly denounced the passivity and cowardice of the Polisario leaders who just sit still while Algerian authorities are regularly torturing and abusing the Sahrawis living in the camps. According to FORSATIN, the protesters are determined to maintain their sit-in near the Polisario headquarters as long as the two traders are detained. However, the separatist movement wants to avoid such incidents, especially now that the UN mediator for the Sahara Christopher Ross is about to undertake a new tour in the region. To calm down the anger, Mohamed Abdelaziz has dispatched some higher-ranking messengers to the protesting tribes to assure them that the two arrested refugees will be released as soon as the Polisario leadership gets the Algerian army’s approval.